Malinche Of Mexico Has Some Things In Common With Pocahontas — Except People Call Her A Traitor : Goats and Soda La Malinche was an Indian woman who served as an interpreter for Cortes — at a cost to her reputation. Even 500 years later, she's reviled in Mexico. Despite Similarities, Pocahontas Gets Love, Malinche Gets Hate. Why? 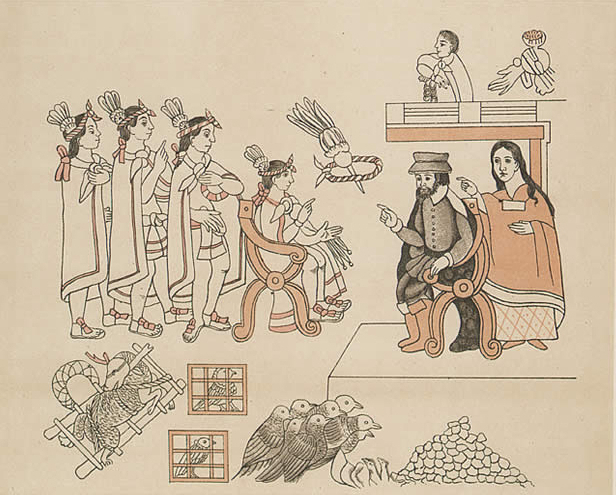 An artist's depiction of the meeting of Hernan Cortes and La Malinche with the Aztec emperor Montezuma II. Pocahontas had nothing to do with the first Thanksgiving. She died in 1617, four years before the celebration in Plymouth. Neither did Malinche, her Mexican counterpart, who lived in the 1500s. But I've been thinking about both women on the eve of the Thanksgiving holiday. They were part of the bigger story — the clash between the Native Americans who lived on this land and the European explorers and settlers who came and conquered. Malinche, as it happens, just made headlines in Mexico. It was otherwise a pretty typical moment in Latin television: several crisp, coiffed sports commentators having a faux outraged argument about soccer. The show was Futbol Picante, spearheaded by renowned Mexican sports journalist José Ramón Fernández. It airs on ESPN Deportes, a network aimed primarily at Latinos in the U.S. It was early September. One of the TV sportscasters was outraged at how Mexican player Javier 'Chicharito' Hernández had been treated by the Manchester United coach. But Fernández was on Manchester United's side. That's when the co-host threw the insult: Perhaps Fernández was a malinchista, which means a traitor to one's own people, someone who prefers a foreign culture over his own. The comment spread throughout the world of sportsblogs like wildfire. "José Ramón Fernández, ¿malinchista?" asked one op-ed. "I used to respect him, but he has turned into a crazy old malinchista!" laments one commenter on the YouTube video. So who was this woman, Malinche, whose very name, more than 500 years after the Spanish conquest, continues to elicit such ire? Malinche was an Native American woman who aided Spanish conquistador Hernán Cortés, with whom she had a child. In many ways her story parallels that of Pocahontas, but she's often invoked as an Uncle Tom. Pocahontas has a very different reputation. Thanks to Disney, the first thing that may come to mind is a scantily clad babe engaged in a forbidden romance with John Smith, a blond hunk with a helluva jawline. She was the daughter of Powhatan, chief of Tsenacommacah. English Captain John Smith arrived in Virginia in 1607, and months later was captured by her brother. The legend goes, he was set to be executed, and Pocahontas saved him. Her real story is hard to pin down but what we do know is quite brutal. Her real name was Mataoka. Pocahontas was a nickname, which means "naughty one." She was around 10 years old when she met Smith, who is often described in historical accounts as abrasive and ambitious. There are many theories as to why the Powhatan spared Smith, but they have little to do with an unlikely romance with Pocahontas. Historians think Smith was simply more valuable alive than dead to broker relations between the English and the Powhatans. In 1612, around the age of 17, Pocahontas was held hostage for a year. In The True Story of Pocahontas, The Other Side of History Dr. Linwood "Little Bear" Custalow writes the oral history of the Mattaponi tribe, which states that Pocahontas was raped during captivity. She was married off to John Rolfe, a widower nearly twice her age. (He's responsible for commercializing tobacco.) According to several sources, she was already married to an Indian warrior, with whom she'd had a child. In any case, she was renamed Rebecca Rolfe and taken to England. Pocahontas died at age 21, on a ship back to Virginia. Like Pocahontas, Malinche is a woman of many names. She's also known as Malintzin and was later renamed Marina by the Spanish. The facts about Malinche are also obscured by myth, and by the interests of the men who wrote her into history. She's believed to have been born sometime around the early 1500s. She was among twenty women given to the Spaniard in 1519 by a Mayan lord. Bernal Diaz Del Castillo, who traveled with Cortés wrote: "What the other women were named, I do not know, cannot remember all the names, and it isn't important ... Cortés allotted one of them to each of his captains and Doña Marina, as she was pretty, engaging, and hardy, he gave to Alonzo Hernández Puertocarrero." Malinche's translating services are described in various texts as instrumental to the Spanish conquest. Cortés, who like John Smith, had a nasty reputation, only mentioned her twice, briefly, in correspondence with the Spanish crown. "La lengua...que es una India desta tierra": "the tongue (translator)... who is an Indian from this land." Iconic Mexican writer Octavio Paz wrote about Malinche as both a victim and a traitor: "It is true that she gave herself voluntarily to the conquistador, but he forgot her as soon as her usefulness was over. Doña Marina becomes a figure representing the Indian women who were fascinated, violated or seduced by the Spaniards. And as a small boy will not forgive his mother if she abandons him to search for his father, the Mexican people have not forgiven La Malinche for her betrayal." In English, no one would say you're "pulling a Pocahontas" if you help someone who is not to be trusted. So why is malinchismo thrown around as an insult? To find out, I reached out to Sandra Cypess, professor emeritus of Latin American history at the University of Maryland. She's the author of La Malinche In Mexican Literature: From History To Myth. 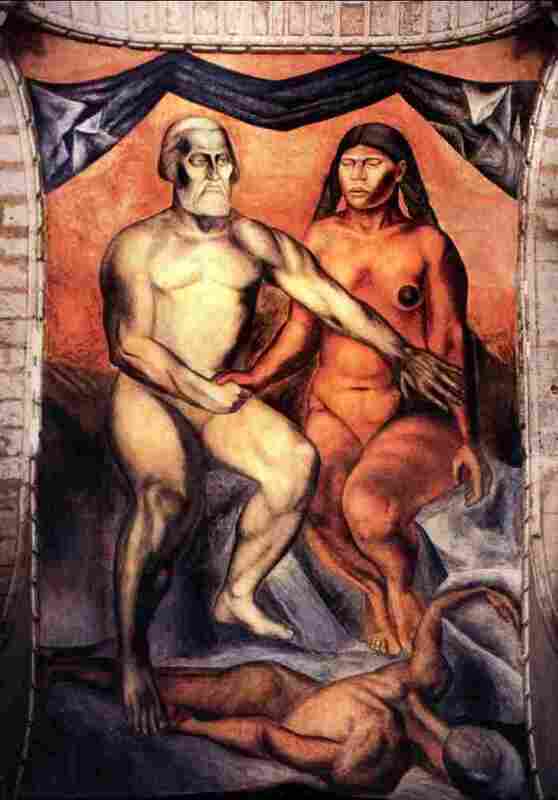 Cypess told me to take a look at the Mexican painter Jose Orozco's most famous work, in which Malinche and Cortes are portrayed as Adam and Eve. The negative image that Malinche has is due to "the influence of Catholicism" on Mexican culture, she explains. "All the information about Eve as a bad person falls on the shoulders of Malinche. She is the Mexican Eve." Cypess also points out that Malinche's bad reputation is not as old as her story: When Mexico broke free of Spain, she began to be cast in novels and popular culture in an evil light, as the traitor. "The real Malinche, of flesh and bone, must have been very intelligent." Cypess tells me. "Here's something interesting: In the Catholic faith women were not supposed to talk in public. And she talked. In Aztec culture, Moctezuma, was the Aztec ruler, known also as Tlatoani, or 'he who speaks.' Only the powerful spoke. And this slave woman broke the rules when she became a translator." Ultimately, Cypess points out, characterizing Malinche as a traitor and Pocahontas as a heroine gives the women a free will they didn't really have. Becoming a savior or a villain, taking on a lover or rejecting him — these are choices. Neither woman had much say in her fate. In the '60s and '70s feminist movements, especially in Chicano literature, started rescuing Malinche's reputation. They saw her as a woman who survived a life trapped between two cultures, and ultimately, "mother of all mestizos." But her name remains a popular insult. "P-nche, que dificil ser Malinche"/ "F--, how hard it is to be Malinche."